Allergy Advice: Contains Wheat, Egg, Soybean, Milk, Sesame. Store in a cool dry place, away from direct sunlight in an air-tight container. 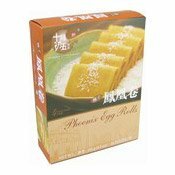 Ingredients: Wheat Flour, Sugar, Egg (20%), Coconut, Vegetable Shortening, Margarine (Soybean, Milk), Sesame Seed, Raising Agents (E450(i), E500(ii), E341(i)). 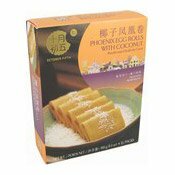 Simply enter your details below and we will send you an e-mail when “Phoenix Egg Rolls (Coconut) (十月初五鳳凰卷)” is back in stock!